First Appearance: Fantastic Four (vol. 1) #357 (Oct. 1991): "The Monster Among Us!" 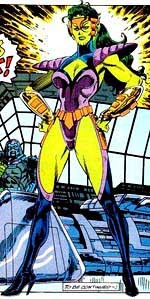 First Appearance (Additional Details): (impersonating Alicia Masters) Fantastic Four (vol. 1) #265 (Apr. 1984): "Home Are the Heroes"; (as Lyja) Fantastic Four (vol. 1) #357 (Oct. 1991): "The Monster Among Us!" Fantastic Five (vol. 1) #1 (Oct. 1999): "5"
Fantastic Five (vol. 1) #2 (Nov. 1999): "Wrecked and Walloped by the Wizard's Warriors"
Fantastic Five (vol. 1) #3 (Dec. 1999): "Side By Side with Spider-Girl"
Fantastic Five (vol. 1) #4 (Jan. 2000): "The Startling Secret of Reed and Sue Richards"
Fantastic Five (vol. 1) #5 (Feb. 2000): "In Search of Doom"
Fantastic Force (vol. 1) #7 (May 1995): "The Masque of Doom!" Fantastic Force (vol. 1) #8 (June 1995): "Cruel and Inhuman Punishment"
Fantastic Force (vol. 1) #9 (July 1995): "The Torch is Passed"
Fantastic Force (vol. 1) #11 (Sep. 1995): "Lest Ye, in Turn, Be Judged"
Fantastic Force (vol. 1) #18 (Apr. 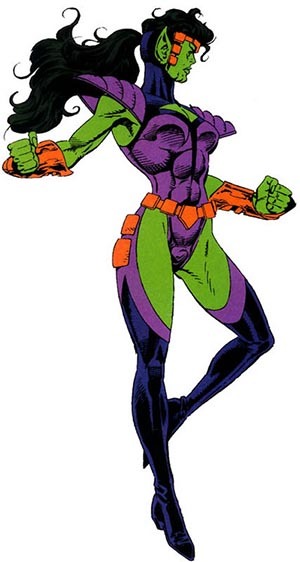 1996): "A Force of One"
She-Hulk Vol. 7: Here Today... (Mar. 2009): "Cosmic Collision"
She-Hulk: Cosmic Collision #1 (Feb. 2009): "Cosmic Collision"